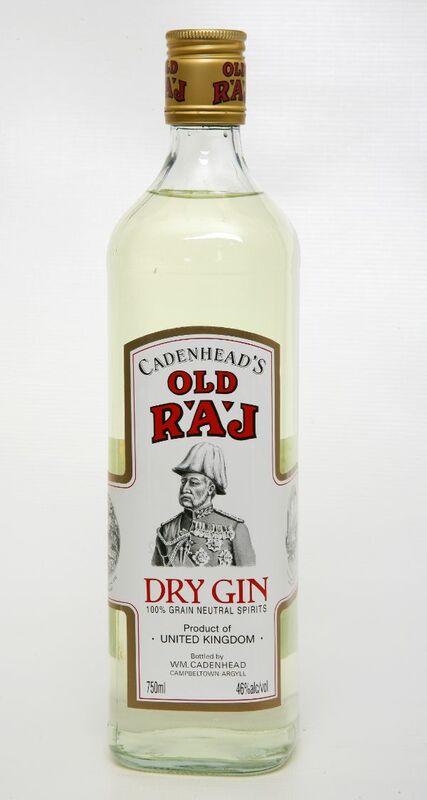 Old Raj Gin is produced by compounding gin flavor (essence) with a neutral Scottish grain spirit. The gin essence is prepared by steeping the botanicals, principally juniper, but also coriander seed, angelica root, lemon and orange peels, orris root, cassia bark and almond powder in an alcohol/water mixture for 36 hours and then distilling it in a small pot still. Cadenhead’s Old Raj Gin is distinctive in that it contains a measure of saffron, the rare and costly spice derived from the crocus flower. In addition to a slightly spicy flavor, this also imparts a pale yellow color. The addition of the saffron is undertaken personally by the company chairman, in order to ensure a consistency in flavor and color each time Old Raj is bottled.